Pair of English Flow Blue & Heavy Gilt Porcelain Lamps, c. 1860. Pair of English Porcelain Lamps, c. 1860. A large pair of English Porcelain Lamps converted from Oil lamps -dating circa 1860. A beautiful composition of porcelain with a bronze foot. They are decorated in an underglaze flow blue with handpainted heavy gold over top with a unique floral pattern around the body. It features a decorative shape with scroll and bead design, as well as a sturdy four-legged footed base in gilt bronze. All electrical is updated in solid working condition. A delightful pair of lamps perfect to brighten up any space. 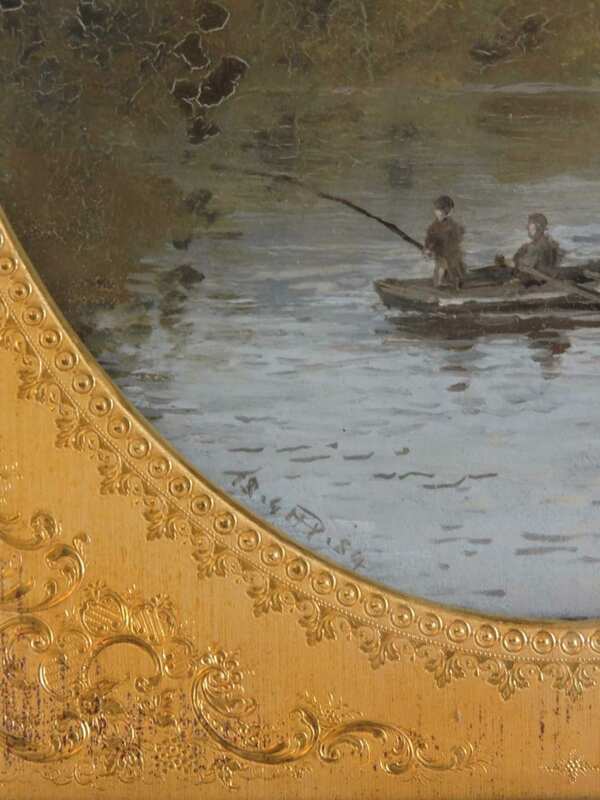 Set of 2 – Oil on Panel under beautifully decorated Oval-shaped Gilt Bronze/Metal Matting – by George Harrison Park (19th century Artist). 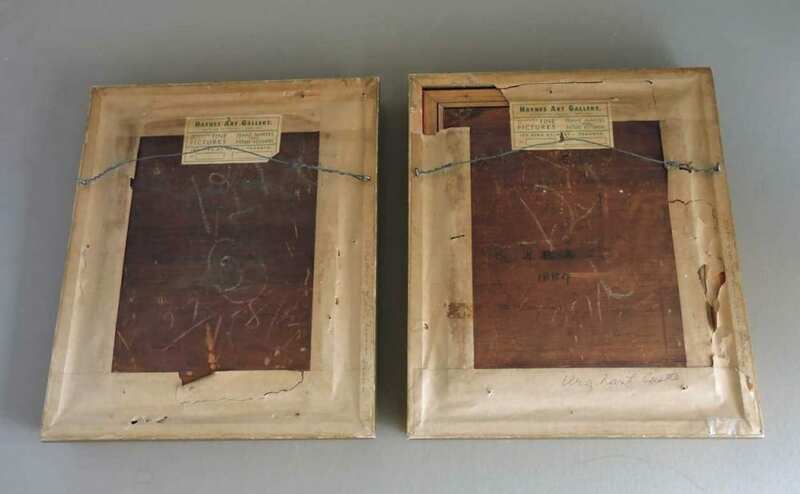 Each painting signed and dated 1884. – One painting of Invergarry Castle & the other of Urquhart Castle. Measures: 12 inches long x 10 inches wide. Oil on panel: 8 inches in diameter. 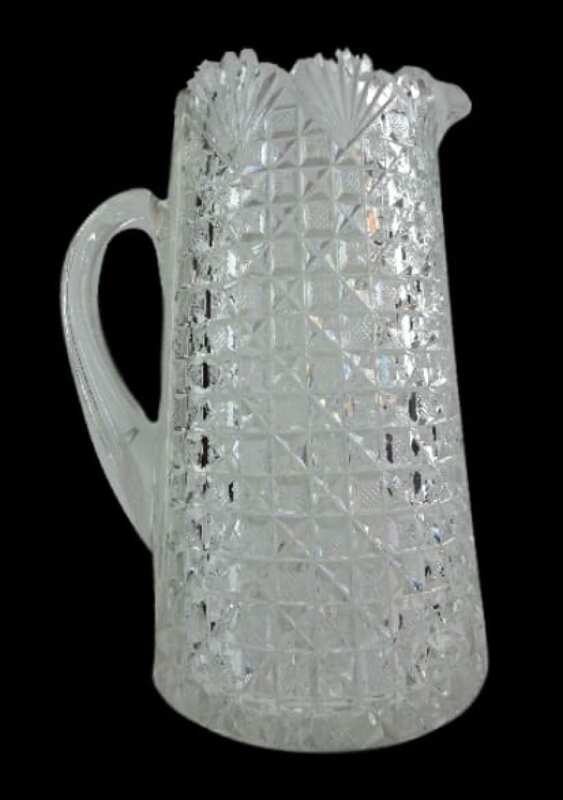 A ‘Crystal Glass Jug – American Brilliant Period Cut Glass’ – made in America – date circa 1900. 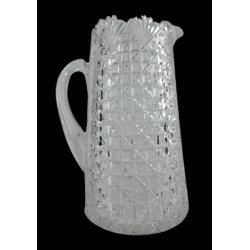 It features a nice heavy body and design, decorated with a rich deep cut glass pattern with a chain of hobstar motifs with alternating stacks of little stars throughout. Beautiful condition. 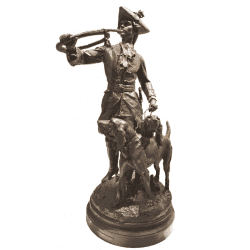 A Spectacular ‘French Bronze Study of ‘Pipuer au Relais’- ‘huntsman with horn and hounds’ – dates late 19th century, ‘HippolyteMoreau & Prosper Lecourtier’. Beautiful aged brown patina throughout the bronze with touches of colour in the hat, ruffled cuffs and collar and grass. Hippolyte- François Moreau (French, 1832-1917) and Prosper Lecourtier (French, 1851- 1924). Signed. HiP Moreau-Lecourtier – with Paris foundry coin mark. A beautifully hand painted Vienna, Austrian plate with a scene of two woman holding “Cupid” and clipping his wings. The cobalt blue border is decorated with gold swans with wreaths in between each swan. The painting is signed: A. Wale. It is titled on the back: ‘Cupido u Cephisa’. The painting is after Angelica Kauffman. Marked on back – Blue ‘Beehive’ mark with Austria above it. Titled: Cupido u Cephisa. Signed A. Wales on Front. Pair of Austrian, Vienna Medium Covered Urns, circa 1900. 13 inches high. A pair of colourful Vienna, Austrian medium covered urns with transfer scenes with overpainting on the front of each. The urns have gold trim and handles. Colours of green and red with white background. Each ovoid shape body sits on a square base. Beautiful quality. Marked. ‘Gold Beehive’ mark on bottom of each. Typical of Austrian porcelain. Measures: 13 inches tall x 5 inches wide. Vintage Jay Flex Sterling & Rhinestones Necklace & Earrings Set. A lovely sterling backed Necklace and earrings set with emerald coloured pear shaped rhinestones surrounded by clear rhinestones. A lovely colour combination. Very rich looking. The backing is stamped Jay Flex and Sterling . Excellent condition. (Note: A matching bracelet is available at an extra cost that needs some rhinestones replaced). Miniature English Sterling Hallmarked – 6 Piece Tea Set. Dated 1949-1950. A fine vintage ‘Miniature English Sterling Hallmarked – 6 Piece Tea Set’ – – made in England, Birmingham, by Barker Brothers Silversmith Ltd, dated 1949 – 1950. The miniature tea set consists of 1 creamer, 1 coffee pot, 1 tea pot, 1 sugar bowl, 1 kettle with stand, and 1 serving tray. Marked. English Sterling Hallmarked. Birmingham. Dated 1949. (Tray dated 1950.) Maker: Barker Brothers Silversmith Ltd.
Creamer: 1 inches tall x 3/8 inches wide. Coffee pot: 1 5/8 inches tall x 1 3/4 inches wide. Tea pot: 1 inches tall x 1 7/8 inches wide. Sugar bowl: 5/8 inches tall x 5/8 inches wide. Kettle with stand: 2 1/8 inches tall (with stand) x 1 1/2 inches wide. Serving tray: 4 inches long (with handles) x 3 inches wide. Excellent condition. Minor wear from age and use. A minor dent in the the miniature kettle on stand – located in the centre. Pair of MINIATURE English Sterling Candelabras. Birmingham. Dated 1940. A ‘Pair of MINIATURE English Sterling Candelabras’ – made in England, Birmingham, Barker Bros. dated 1940. The pair features a plain decorative body, with a unique interchangeable double-arm or single-arm design. Dollhouse miniature size. Marked. English Sterling Hallmarked. Birmingham. Dated 1940. Maker: Barker Brothers Silversmith Ltd. Measures: 2 1/4 inches tall (with candle sticks) x 1 1/2 inches wide. Excellent Condition. Minor wear from gentle wear and age. 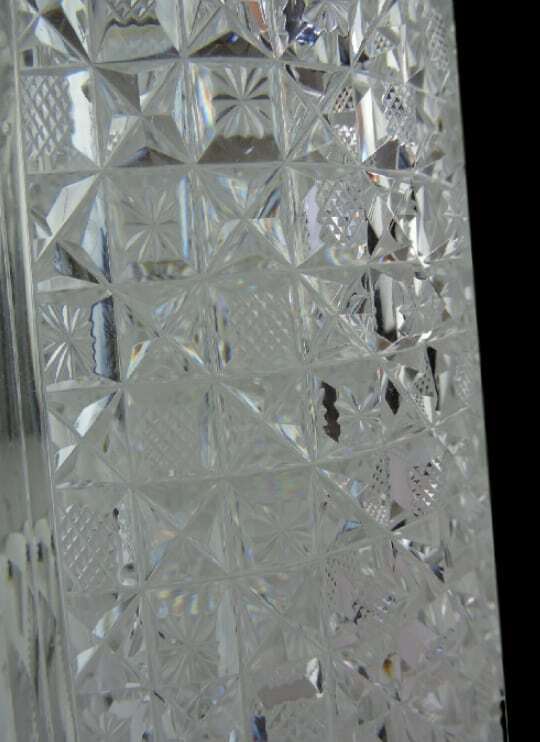 A spectaular pate sur pate vase by Mintons – by one of the rarest artists in this technique – Albion Birks. The 2 handled vase has much gold decoration on the body, handles, base and lid. The centre is a pate sur pate scene is of a classical woman reaching for flowers in a jardiniere full of flowers (white over pink/salmon colour background). The pate sur pate scene is signed “Birks”. 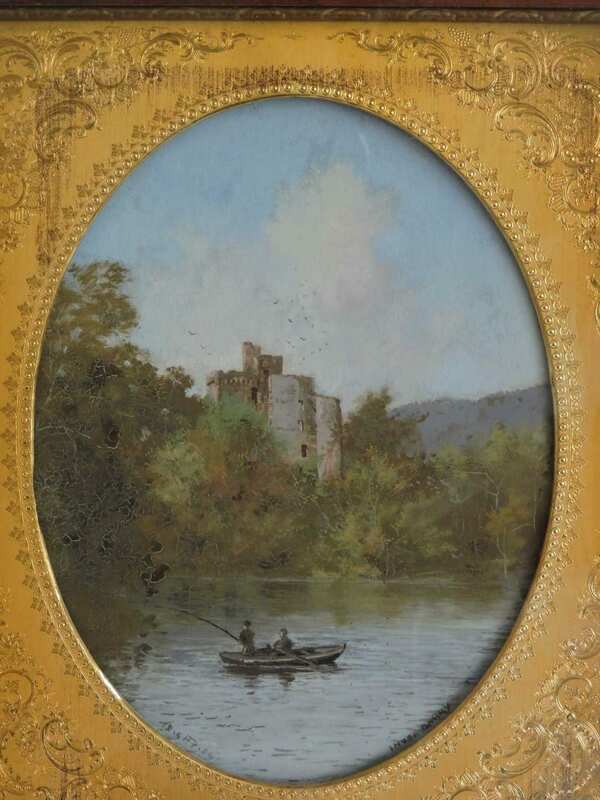 Marked – Mintons, England on bottom – signed Birks on pate sur pate scene. Measures: 13 1/2 inches tall x 6 1/2 inches wide. Excellent condition (some professional gold touch up to 1 handle – which only is only seen by a trained eye). Set of 12 – Royal Cauldon – Chargers – 11 1/8 inch Plates in Botanical Flower Pattern – C.1930. A ‘Set of 12 – Royal Cauldon – Charger Plates in Botanical Flower Pattern – C.1930’ – made in England. 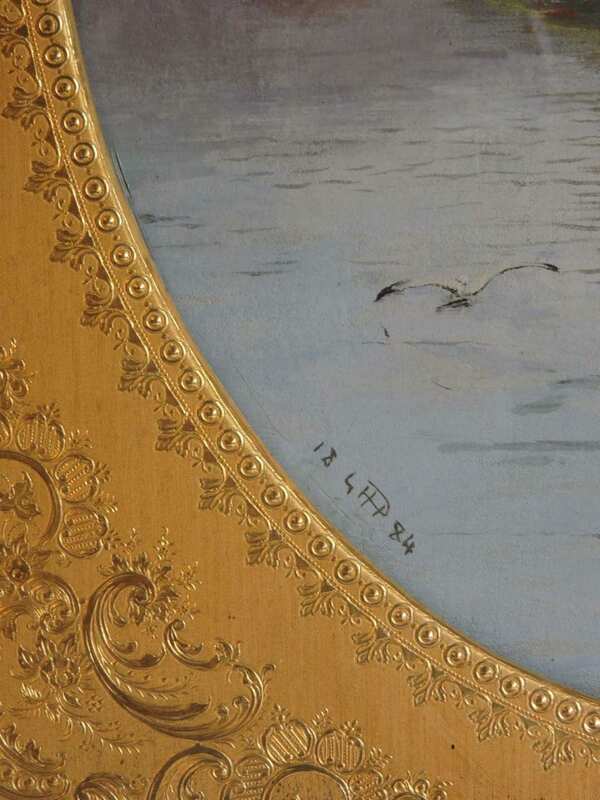 Each plate features an unusual large shape with a unique design with a botanical flower in the centre, decoarted with floral, scroll and leaf motifs throughout the rim. Measures: 11 1/8 inches in diameter. 19th Century- ‘Sevres’ Style Porcelain Garniture Set with Hand Painted Classical Scenes – Artist Signed. A 19th Century – ‘Sevres’ Style Porcelain Garniture Set with Hand Painted Classical Scenes – Artist Signed. 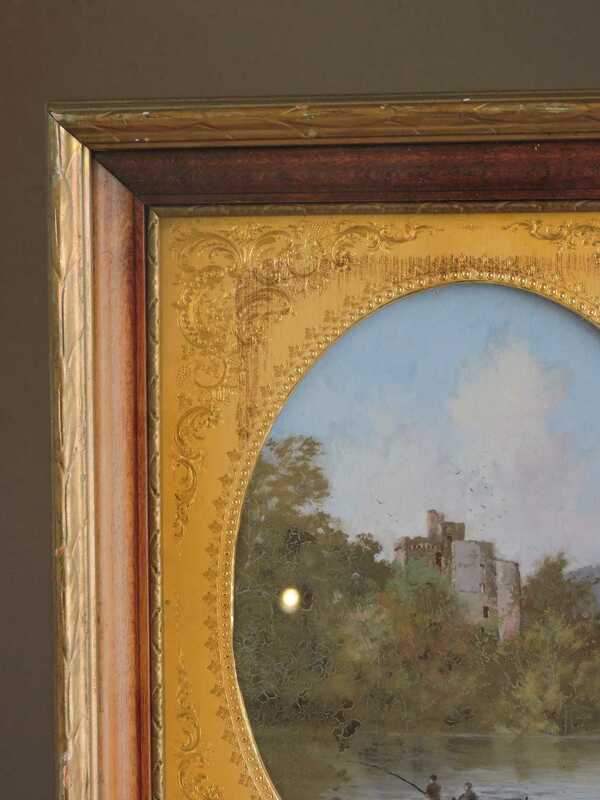 It features 2 sealed lidded vases and 1 bowl-shaped vase with ormolu handles and mounts, hand painted in a matching blue over white with gold decorations and a unique classical scene of a ‘Lady and Gent’ – signed by an unknown French artist. 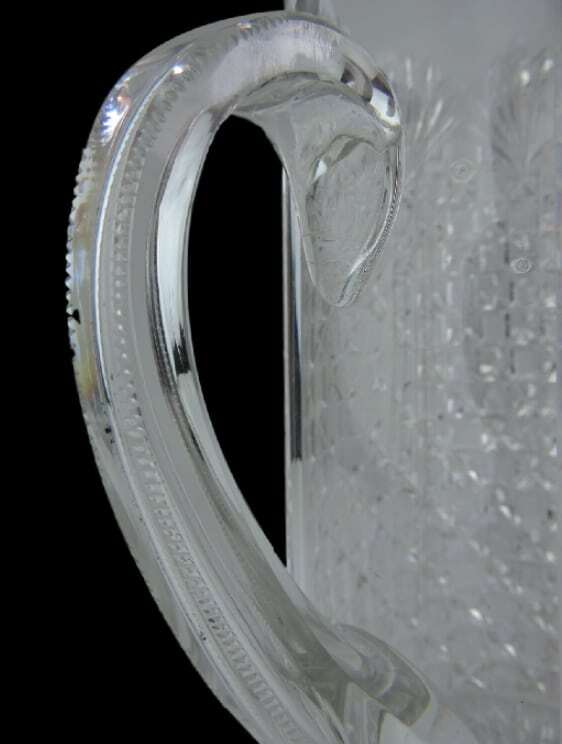 An ‘Old English Sheffield – Silver Plate Lidded Samovar or Tea Urn’ – made in England – dates circa, 1860. It features an unusual lidded samovar or tea urn design with Regency and Victorian Period influence, decorated with an elegant repousse pattern with scroll, floral and leaf motifs. Beautiful condition. No mark. English Sheffield Silver Co. Measures: 18 inches tall x 14 inches in diameter. Set of 5- French Limoges – Tea Cups & Saucers – C.1930. A ‘Set of 5- French Limoges – Tea Cups & Saucers- C.1930’ – made in France. Each tea cup and saucer features a hand painted pattern in a gold, blue over white, with dot, line and scroll decorations. Beautiful quality – perfect for tea or espressos. Marked. Limoges. (Crest. S.C.) France. In green. Saucer measures:5 3/8 inches in diameter. Cup measures: 2 1/2 inches tall x 3 inches wide. A ‘Set of 8 – Birks Sterling Silver & Glass Coasters With Caddy Holder Stand’ – made in America- dates early 20th century. It features 8 matching clear glass coasters with sterling rims, decorated with simple scroll and floral motifs, with 1 matching sterling coaster caddy holder stand. Coaster Caddy Stand Measures: 5 1/2 inches tall x 3 1/2 inches wide. A English Silver Hallmarked – Asparagus Server -‘ – dates circa, 1890. It features a late Victorian design with an unusual pierced end with a heavy repousse handle, decorated with floral, scroll and shell motifs.